Meal planning is one of the most important considerations for any backpacking trip. Your food choices should depend on taste preference, nutritional value, the caloric density of each meal, and how easy it is to cook. In this post we aim to outline our general backpacking food strategy and suggest some of our favorite meals. Meal planning is one of the most important considerations for any backpacking trip. Your food choices should depend on taste preference, nutritional value, the caloric density of each meal, and how easy it is to cook. Keeping food weight down is a critical backpacking skill that usually takes experience to master. Most seasoned backpackers opt for lightweight, calorically dense foods that are very easy to prepare. With this mentality, ease and weight tend to trump nutritional value, which can sometimes lead to a heavily processed food bag. Another approach is to spend time and effort building nutritional value into your meals beforehand. This method involves preparing DIY dinner recipes, using a food dehydrator to make trail snacks, and being more willing to carry extra weight for highly nutritious, yet not as calorically dense foods. LEAVE NO TRACE - You love nature. That's why you're out there and that’s why you’re reading this post. So please, always pack out your trash and any food you don’t eat. Yes, truly following LNT rules includes packing out things like spent coffee grounds, orange rinds, and apple cores. Always scan your campsites and lunch spots before hiking on, and if you’re a true LNT rockstar, help pack out trash left behind by careless backcountry travelers. Check out our LNT tutorial video for a quick refresher. FOOD STORAGE - Proper food storage is incredibly important for backcountry wildlife. For example, bears that learn to associate humans with food often need to be trapped and killed. So please, always store your food properly in the backcountry. We hesitate to even teach proper bear bagging techniques anymore, because most hikers don’t take the time to do it properly. And even if they do, really smart bears can still bring down a good bear hang. The safest bet for backcountry food storage is an Ursack or Bear Canister. CALORIE INTAKE - Backpackers burn a lot of calories on the trail. On average, hikers usually burn between 3000-4000 calories per day, but thru-hikers crushing 20-30 mile days can easily burn 5000-6000 calories. It’s crucial to pack enough nutrients to give your body the energy it needs. This important calculation will also depend on your size, weight, age, and activity level. WEIGHT - Bringing too much food is one of the most common beginner backpacking mistakes. And that’s understandable, who wants to risk going hungry in the woods? But carrying a bunch of unnecessary weight can quickly dampen spirits on backpacking trips, so a little experience and pre-trip calorie calculation will go a long way. CALORIC DENSITY - It’s also important to consider how calorically dense your backpacking food choices are to keep your pack weight down. High-fat foods like olive oil, nuts, peanut butter, and chocolate tend to have high calorie-per-ounce ratios. On the other hand, fresh fruits and vegetables tend to have low calorie-per-ounce ratios. The ideal range is around 120-130 calories-per-ounce total. FOOD VOLUME - Certain foods will take up a lot more space in your pack than other foods containing same amount of calories would (think bagels vs almonds). This isn’t a big deal on short trips, but on long journeys, and especially when bear canisters are required, you’ll want to pay close attention to how much space your food choices will take up. NUTRITION - Good nutrition on the trail is just like eating right at home. You’ll want a balance of fats, proteins, and carbohydrates while getting as much fiber, fruits, and vegetables into your diet as possible. It’s hard to eat really healthy on the trail because processed foods tend to be much more convenient, but finding a good balance is key. Also, we always load up on fresh, healthy foods the moment we're back in town. CONVENIENCE - After a long day of hiking, chances are you won't want to prepare an elaborate meal. Nor will you want to clean up a bunch of dirty dishes when you're done eating. So we recommend keeping it simple. For dinners, this means we almost always eat “just add water” meals and for breakfast we usually have hot coffee with bars and snacks. WATER ACCESS - If your dinners require water for cooking, you'll want to camp near a water source or make sure to pack plenty of water for a dry camp. If you’re backpacking in an area with scarce water, make sure to plan accordingly..
FUEL - Most backcountry meals require a small stove for cooking - CleverHiker Stove Buyer's Guide. Plan out how many times you'll need to cook (including coffee and tea) to calculate how much fuel to bring. Fuel usage rates vary depending on the stove model, pot size, elevation, and temperature, so knowing exactly how much fuel to bring will take some experience. On an average 5-day, two-person backpacking trip, we usually boil water about 10 times (once for morning coffee and once for dinner), and one small 100 gm isobutane fuel canister is usually more than enough. COST - You’ll usually pay for convenience with backpacking food. Freeze dried meals tend to cost around $7-12 each, but they're also tasty, convenient, and don't require any cleanup. We enjoy Mountain House, MaryJanesFarm, Packit Gourmet, Backpacker's Pantry, and Good To-Go when we're not preparing our own meals. REPACKAGING FOOD - It’s always a good idea to repackage food in ziplock bags to reduce bulk and have the ability to reseal containers. If you can't close a food package securely, chances are it will explode in your pack and make a big mess. SPICES & CONDIMENTS - Eating too much of the same thing over the course of a 5-day backpacking trip will probably drive you nuts. Small packets of salt, pepper, olive oil, hot sauce, and fast food condiment packets (mayo, mustard, relish, etc) can really elevate your backcountry grub. And if you want to get super fancy, you can even get a GSI Spice Missile to carry up to 6 spices for less than 2 oz. FRESH FOODS - We love bringing a couple pieces of fresh fruit, like apples and oranges, on the trail. Fresh fruits have poor calorie per ounce ratios, but they’re a great treat in the backcountry and we like the added nutritional value too. Carrots and snap peas are also a nice healthy treat that will last a couple days if temperatures aren’t too hot. AVOID CANNED FOODS - Canned foods are almost always way too heavy, don’t have enough calories, and create bulky trash to pack out, so we always avoid them. DIY DEHYDRATED MEALS - If you have the time and energy, it can be nice to make your own trail meals and dehydrate your own snacks. A quality food dehydrator will quickly zap the water out of fruits, veggies, and meats for some awesome DIY trail grub. HOT DRINKS - Warm beverages and soups are a really nice treat in the backcountry, especially on chilly trips where it’s harder to stay hydrated. We like to sip on tea, cider, and hot cocoa around camp when the temperature dips. ALCOHOL - Generally speaking, it’s not good to drink alcohol right before going to bed. Not only can it disrupt your sleep cycle, but you may also have to use the bathroom more during the night. That said, whiskey and wine tend to make our pack lists on most trips, especially on casual treks with friends. We carry them in trusty, lightweight containers like the Platypus Wine Bag and Flask2Go. We almost always start our trail mornings off with a warm cup of coffee. Yum! After testing many coffee powders, cubes, bags, and brew styles, our favorite option for taste and convenience is Starbucks Via. We usually have a quick, cold breakfast with our coffee and break camp to hit the trail early - mornings in the wilderness are so peaceful, and one of our favorite times to hike. 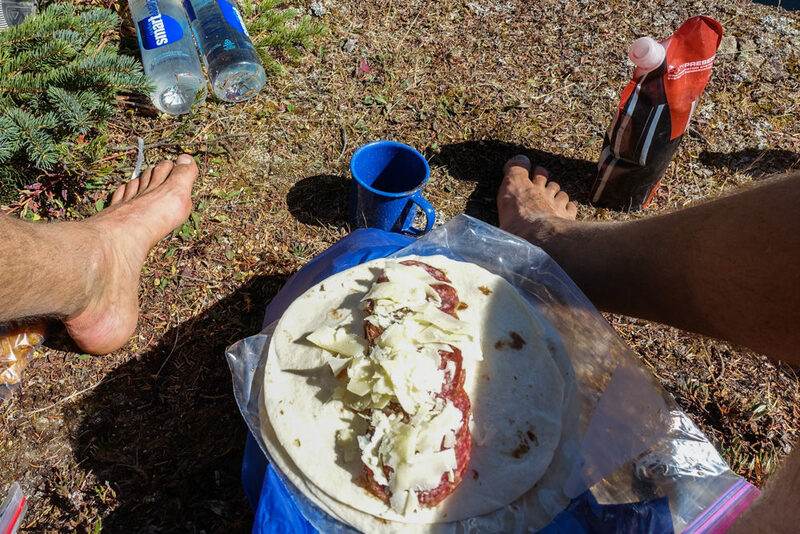 We almost always have a cold lunch on the trail to avoid the time, effort, and fuel required for cooking. We commonly make tortilla or bagel sandwiches with hard meats and cheeses. Bagels and tortillas tend to hold up well on the trail and provide relatively dense calories. Hard meats and cheeses will easily last a few days, though they’re not great choices for hot weather trips. Peanut butter, jelly, honey, and foil packages of tuna or chicken are also good sandwich fillers. With foil packages, we'll mix up tuna or chicken with fast food condiment packs (mayo, mustard, etc.) and make tuna/chicken salad sandwiches. The main downside to tuna/chicken packets is they're a bit heavy for our liking. Hard Meats - Salami, Summer Sausage, etc. Hard Cheese - Parmesan, Romano, etc. Small Condiment Packets - Mayo, Mustard, Relish, Hot Sauce, etc. Freeze dried meal pouches (Mountain House, MaryJanesFarm, Good To-Go, PackIt Gourmet, etc.) are a convenient, lightweight, and tasty option for backpacking dinners. For some of our favorites, check out our Best Freeze Dried Backpacking Meals list. When we’re on casual trips with friends, we like to pick a few of our favorites for dinner. 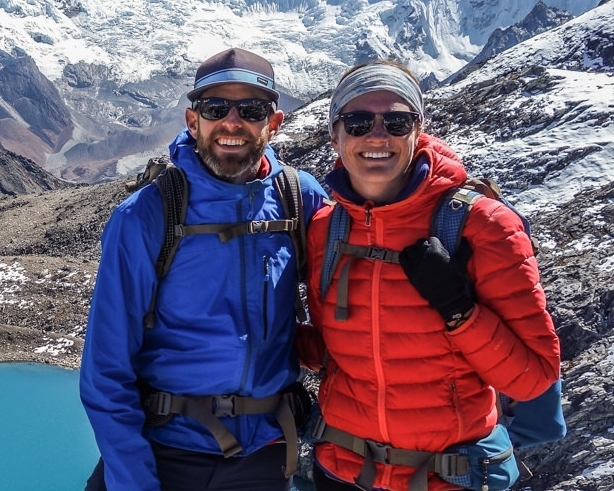 Most freeze dried meals cost around $7-12 and feed two hikers, though your mileage may vary. Snacks are a critical part of any good trail diet. You’ll be burning a ton of calories on long hiking days, so eating a small snack every hour or two is a good way to keep your engine running. We always keep a few snacks in our hip belt pockets while we hike for easy access. WHAT'S IN OUR CAMP KITCHEN? When we head out on backcountry trips, these are the items usually found in our packs. For more information on our favorite gear, check out the CleverHiker Backpacking Gear Guide and our Stove Buyers Guide. We hope this guide helps you with backcountry meal planning. If you found this guide helpful, please share it with your friends and click the little heart button below to give us a digital high five!